"When Isabel meets Edward, both are at a crossroads: he wants to follow his late wife to the grave, and she is ready to give up on love. 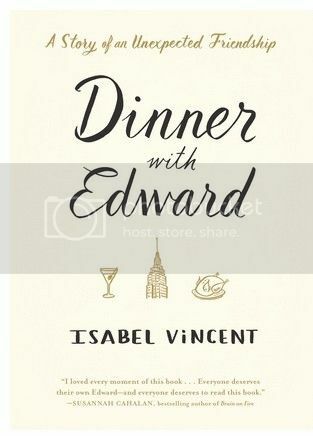 Thinking she is merely helping Edward’s daughter--who lives far away and asked her to check in on her nonagenarian dad in New York--Isabel has no idea that the man in the kitchen baking the sublime roast chicken and light-as-air apricot soufflé will end up changing her life. I used to read a lot of books about food or with food themes, mainly nonfiction and memoir, then somehow I got away from it. Ruth Reichl's excellent novel Delicious was the last really good food-themed fiction book I read, so I'm looking forward to this one. That sounds like a really different, but interesting story. I look forward to your review but think I'll pop over to Amazon now. Just been over there and it's not released until 24th May and only in hardback. I'll add it to my TBR list and wait for the paperback. Read Ruth Reichl's My Kitchen Year. Excellent book. It's like reading her journal on her way from the magazine closing down to finding herself again.